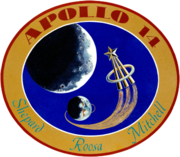 Apollo 14 was the eighth manned mission in the United States Apollo program, the third to land on the Moon, and the first to land in the lunar highlands. It was the last of the "H missions," targeted landings with two-day stays on the Moon with two lunar EVAs, or moonwalks. Commander Alan Shepard, Command Module Pilot Stuart Roosa, and Lunar Module Pilot Edgar Mitchell launched on their nine-day mission on Sunday, January 31, 1971, at 4:03:02 p.m. EST. Liftoff was delayed forty minutes and two seconds, due to launch site weather restrictions, the first such delay in the Apollo program. Shepard and Mitchell made their lunar landing on February 5 in the Fra Mauro highlands – originally the target of the aborted Apollo 13 mission. 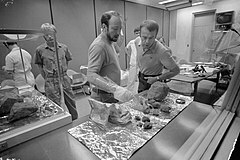 During the two lunar EVAs, 94.35 pounds (42.80 kg) of Moon rocks were collected, and several scientific experiments were performed. Shepard hit two golf balls on the lunar surface with a makeshift club he had brought with him. Shepard and Mitchell spent 33​1⁄2 hours on the Moon, with almost 9​1⁄2 hours of EVA. In the aftermath of Apollo 13, several modifications had been made to the service module electrical power system to prevent a repeat of that accident, including a redesign of the oxygen tanks and the addition of a third tank. The launch had been scheduled for October 1, 1970, and was delayed about four months. Shepard was the oldest U.S. astronaut when he made his trip aboard Apollo 14. He is the only astronaut from Project Mercury (the original Mercury Seven astronauts) to reach the Moon. 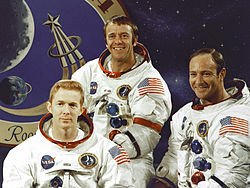 Another of the original seven, Gordon Cooper, had (as Apollo 10's backup commander) tentatively been scheduled to command the mission, but according to author Andrew Chaikin, his casual attitude toward training, along with problems with NASA hierarchy (reaching all the way back to the Mercury-Atlas 9 flight), resulted in his removal. The mission was a personal triumph for Shepard, who had battled back from Ménière's disease which grounded him from 1964 to 1968. He and his crew were originally scheduled to fly on Apollo 13, but in 1969 NASA officials switched the scheduled crews for Apollos 13 and 14. This was done to allow Shepard more time to train for his flight, as he had been grounded for four years. After separating from the command module in lunar orbit, the LM Antares had two serious problems. First, the LM computer began getting an ABORT signal from a faulty switch. NASA believed that the computer might be getting erroneous readings like this if a tiny ball of solder had shaken loose and was floating between the switch and the contact, closing the circuit. The immediate solution – tapping on the panel next to the switch – did work briefly, but the circuit soon closed again. If the problem recurred after the descent engine fired, the computer would think the signal was real and would initiate an auto-abort, causing the ascent stage to separate from the descent stage and climb back into orbit. NASA and the software teams at the Massachusetts Institute of Technology scrambled to find a solution, and determined the fix would involve reprogramming the flight software to ignore the false signal. The software modifications were transmitted to the crew via voice communication, and Mitchell manually entered the changes (amounting to over 80 keystrokes on the LM computer pad) just in time. 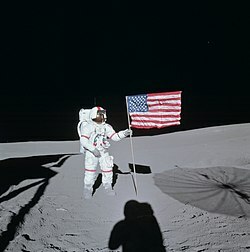 Shepard's moonwalking suit was the first to utilize red stripes on the arms and legs and on the top of the lunar EVA sunshade "hood," so as to allow easy identification between the commander and LM pilot on the surface; on the Apollo 12 pictures, it had been almost impossible to distinguish between the two crewmen, causing a great deal of confusion. This feature was included on Jim Lovell's Apollo 13 suit; because no landing was made on that mission, Apollo 14 was the first to make use of it. This feature was used for the remaining Apollo missions, and for the EVAs of Space Shuttle flights afterwards, and it is still in use today on both the U.S. and Russian space suits on the International Space Station. The "Big Bertha" rock (Lunar Sample 14321) was the third largest rock collected during the Apollo program. In 2019, it was discovered that this is the oldest known rock from Earth, 4 billion years old. After landing in the Fra Mauro formation—the destination for Apollo 13—Shepard and Mitchell took two moonwalks, adding new seismic studies to the by now familiar Apollo Lunar Surface Experiments Package (ALSEP), and using the Modular Equipment Transporter (MET), a pull-cart for carrying equipment and samples, nicknamed "lunar rickshaw". Roosa, meanwhile, took pictures from on board command module Kitty Hawk in lunar orbit. 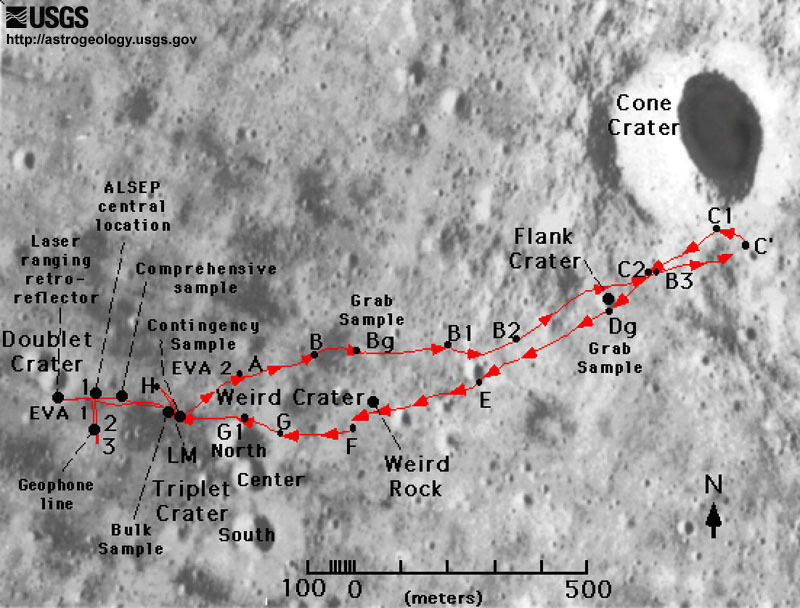 The second moonwalk, or EVA, was intended to reach the rim of the 1,000-foot (300 m) wide Cone Crater. The two astronauts were not able to find the rim amid the rolling terrain of the crater's slopes. They became physically exhausted from the attempt and with their suits' oxygen supplies starting to run low, the effort was called off. Later analysis, using the pictures that they took, determined that they had come within an estimated 65 feet (20 m) of the crater's rim. Images from the Lunar Reconnaissance Orbiter (LRO) show the tracks of the astronauts and the MET come to within 30 m of the rim. The Moon rocks, or lunar samples, from Apollo 14 are unique in that most of the 94 pounds of rocks are breccia, which are rocks that are composed of fragments of other, older rocks. Breccias form when the heat and pressure of meteorite impacts fuse small rock fragments together. There were a few basalts that were collected in this mission in the form of clasts (fragments) in breccia. The Apollo 14 basalts are generally richer in aluminum and sometimes richer in potassium than other lunar basalts. Most lunar mare basalts collected during the Apollo program were formed from 3.0 to 3.8 billion years ago. The Apollo 14 basalts were formed 4.0 to 4.3 billion years ago, older than the volcanism observed at any of the mare locations studied during the Apollo program. In January 2019 research showed that Big Bertha, a 19.837 pound rock, has numerous characteristics that make it likely to be a terrestrial (Earth) meteorite. Granite and quartz, which are commonly found on Earth but very rare to find on the Moon, were confirmed to exist on Big Bertha. To find the sample’s age, the research team from Curtin University looked at bits of the mineral zircon embedded in its structure. "By determining the age of zircon found in the sample, we were able to pinpoint the age of the host rock at about four billion years old, making it similar to the oldest rocks on Earth," researcher Alexander Nemchin said, adding that "the chemistry of the zircon in this sample is very different from that of every other zircon grain ever analyzed in lunar samples, and remarkably similar to that of zircons found on Earth." This means that Big Bertha is both the first discovered terrestrial meteorite and the oldest known Earth rock. The backup crew spoofed the patch with its own version, with revised artwork showing a Wile E. Coyote cartoon character depicted as gray-bearded (for Shepard, who was 47 at the time of the mission and the oldest man on the Moon), pot-bellied (for Mitchell, who had a pudgy appearance) and red furred (for Roosa's red hair), still on the way to the Moon, while Road Runner (for the backup crew) is already on the Moon, holding a U.S. flag and a flag labeled "1st Team." The flight name is replaced by "BEEP BEEP" and the backup crew's names are given. Several of these patches were hidden by the backup crew and found during the flight by the crew in notebooks and storage lockers in both the CSM Kitty Hawk and the LM Antares spacecraft, and one patch was even stored on the MET lunar hand cart. Photographs taken in 2009 by the Lunar Reconnaissance Orbiter were released on July 17, and the Fra Mauro equipment was the most visible Apollo hardware at that time, owing to particularly good lighting conditions. In 2011, the LRO returned to the landing site at a lower altitude to take higher resolution photographs. ^ Bellucci, J.J.; Nemchin, A.A.; Grange, M.; Robinson, K.L. ; Collins, G.; Whitehouse, M.J.; Snape, J.F. ; Norman, M.D. ; Kring, D.A. (March 2019). "Terrestrial-like zircon in a clast from an Apollo 14 breccia". Earth and Planetary Science Letters. 510: 173–185. doi:10.1016/j.epsl.2019.01.010.